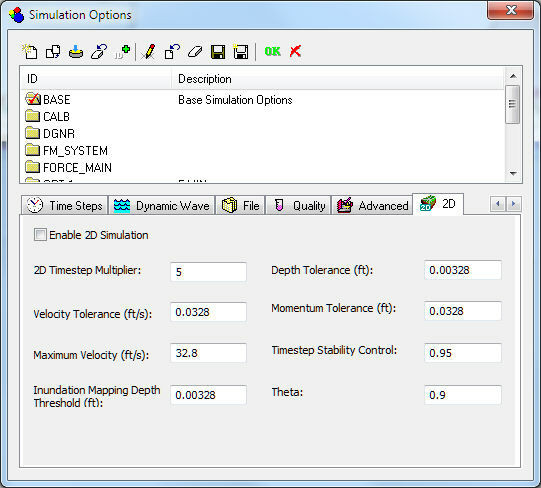 Select the ‘Enable 2D Simulation’ option and set the 2D simulation parameters. For a description of parameters, see 2D Simulation Options topic in the on-line help. 3. You must also set Dynamic Wave as the Routing Model on the General tab of the InfoSWMM Simulation Options. 1. 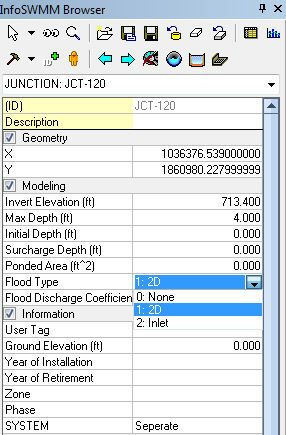 To enable a 1D junction to pass flow back and forth to the 2D Zone, select 2D as the Flood Type in the InfoSWMM Attribute Browser. 2. Enter a Flood Discharge Coefficient (orifice discharge coefficient). The orifice equation governs flow into and out of the rim of the junction. The diameter of the orifice is the diameter of the manhole (junction). This diameter is specified by the manhole area in the InfoSWMM Simulation Options. Manually adjust junction rim elevations (or max depths) to match the ground elevation model you are using at that location. You can use the ArcMap Identify tool to check the elevation of the ground model at that location and adjust the rim elevation in the InfoSWMM Attribute Browser for that junction.